In need of a corporate gift that can help your clients? Promotional Weather Stations can help your customers tell if they will need a coat before they pop out for lunch from the comfort of their own desk. 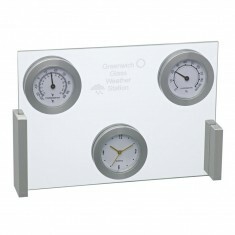 Custom printed weather stations offer an excellent way to make sure your place on customers desks is firmly secured. 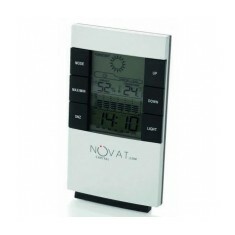 They offer a practical solution to telling the ever changing British weather alongside plenty of other handy features including clocks and hygrometers. From plastic to metal and laser engraving to screen printing, we offer a range of materials and branding methods for our personalised weather stations here at MoJo. 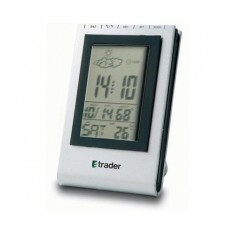 So make sure your customers can check the weather before they head out with their branded weather station. Whatever the weather, our personalised weather stations are there to lend a helping hand. From modern digital Desk Weather Stations to traditional, stylish weather stations like our Greenwich Weather Station, our range has something to suit your promotion. We here at MoJo believe that one of the best executive custom printed weather stations is our Regal Weather Station. Its stylish fold out design looks awesome in any office workspace and when engraved with your design, is sure to take pride of place on any desk. 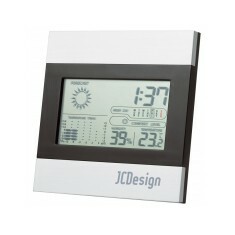 Want to find out how great your design would look on one of these weather stations? Give our sales team a call and we can arrange free of charge visuals to be made for you. 5 different functions. Batteries included. Sturdy plastic. Printed to front face. 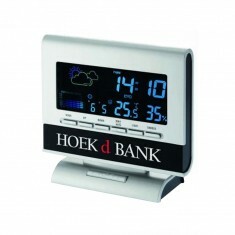 Alarm clock with snooze function, calendar, thermometer and hygrometer. 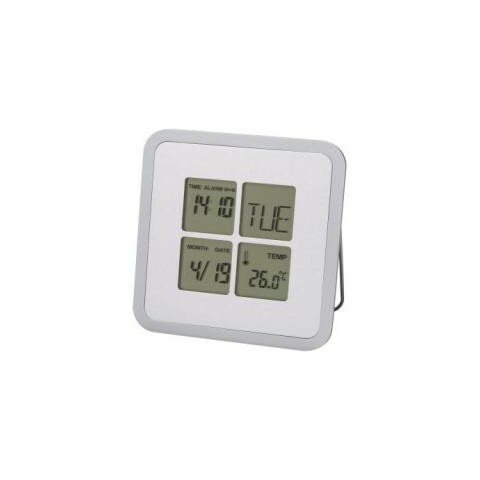 With clock, weather forecast, temperature display, humidity, calendar and alar.. Weather station with attractive, brightly coloured display. 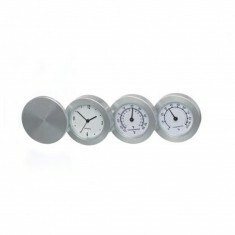 Clock, thermometer and hygrometer which folds together with a metal plate at t..
Aluminium and glass stand housing clock, thermometer and hygrometer. Supplied ..